Hide deals from seller "Chicago's Pita Grill"
Hide deals from category "Mediterranean"
Limit 1 per person and 1 per table. Valid toward any food; drinks excluded. Valid 10 a.m.-3 p.m. only. Dine-in or carryout only. Promotional value expires 60 days from purchase date. Savor some of your favorite dishes with 50% off Mediterranean food from Chicago's Pita Grill in Cragin ($20 value). 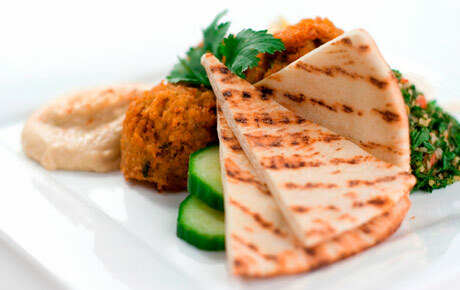 This deal can be used during lunchtime for a mouthwatering array of Middle Eastern delicacies. Chicago's Pita House is new to the area but has already established itself as a purveyor of classic Mediterranean food. Start your meal with baba ganoush or hummus and pita chips to tantalize your taste buds. Then, sink your teeth into one of their signature dishes. Chicago's Pita House serves up favorites like falafel sandwiches, gyros and shish kabobs. This family-owned business prides itself on fresh ingredients, friendly service and a large dining area complete with a high-definition TV. A restaurant in Cragin serving a combination of Mediterranean and Middle Eastern flavors.